My friend and parishioner (Lisa we still claim you even though you moved! 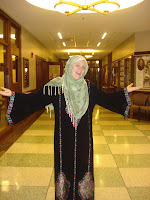 ), Lisa Brown wrote this amazing Facebook note about her experience of wearing a hijab and abaya in honor of Eid. Not only is Lisa an amazing person, she is a fabulous writer and I hope she'll write more and often! I wore a hijab in rural Illinois. It was fascinating. There is a backstory to this. Last Thursday, I asked Farhan (my counterpart here at EIU) if he had any plans for the weekend, and he answered, "Yeah, I'm excited for Eid [the end of Ramadan] tomorrow." He then added that he was considering wearing traditional Pakistani dress to work. When I got home, I had a little epiphany. I have two Saudi abayas (the long, shapeless gown) and a hijab (the headscarf) which were given to me by a couple of generous students back in my ESL teaching days. I had never worn them before because I'd never had an occasion. They're so beautiful it seems like a crime to hang them in my closet, so instead I have them pinned to the wall over my sofa in lieu of a painting. Yon jokes that it makes our house look like a museum, but that's fine with me. I like museums. I gave Farhan a call. "Since you're dressing up tomorrow, I'm going to dress up, too!" Women, you need to know: wearing the abaya is absolutely amazing and I recommend it to everyone. I'm quite convinced that it's the perfect garment. For one, it's comfortable. I felt like I was wearing a nightgown to work. The range of motion in an abaya is incredible. It has the added bonus of covering up all of your flabbier bits. That kangaroo pouch that exists where my abs are supposed to be? Gone, thanks to the abaya. God bless the person that invented the abaya. If only I could wear it every day. The hijab and I, on the other hand... well, we had our issues. First, I couldn't figure out how to wrap the thing. Then I was confused because the hijab I owned was totally see-through, which seemed to defeat the point. I was a little stymied, so I turned to the internetz and learned that if the hijab is see-through, you're supposed to wear something called an "underscarf" underneath. Believe it or not, I actually had a scarf that would serve perfectly as an underscarf. When Ethiopian Orthodox women go to church, they wear a white cotton scarf on their heads. Luckily, I happen to be deeply in love with an Ethiopian Orthodox man whom I went to church with once, so I did own one of these cotton scarves. (Actually, I'm wearing it in my profile picture right now.) Therefore, the Ethiopian Orthodox scarf served as the underscarf for my hijab. I loved the metaphor of this as well. Islam and Christianity living in harmony--on my head. So, from the internetz, I figured out (sort of) how to wrap my hijab. In case you're curious, there's really not one single accepted way of doing it. The net is full of tips for Muslim women on how to wrap their hijabs in fashionable and creative ways. So, I figured that as long as I got the scarf to cover all my hair and my neckline, I was good to go. Honestly, though, that hijab drove me crazy all day for two reason: 1) it made my head sweat, and 2) it kept coming unwrapped and I kept having to fix it. Admittedly, number 2 is probably due to my inexperience as a hijab wrapper. But it gave me some empathy for the female Saudi students I used to teach, whom I often saw inbetween classes in the restroom adjusting their headscarves. It's amazing they usually made it to class on time. I would imagine that Muslim women who wear the hijab every day simply see it as a practical part of being a woman, kind of like wearing a bra. I also imagine, though, that women who convert to Islam need some time to get used to it! So, anyway, when I arrived at school, my boss and my dean were thrilled to see Farhan's and my new getups. I wished Farhan a happy Eid, but I'm never one to do things halfway, so I decided to provide a giant Eid feast for Farhan and the whole floor as a surprise. Some South Asian cuisine would have been ideal, but we don't have an Indian restaurant in Charleston, so I went with Mexican because Farhan likes Mexican. I decided to order a bunch of different types of appetizers to make the experience more communal. I sneaked into the office across the hall to phone the order. I fibbed to Farhan that I had a meeting with Chris Hanlon in English, then went to pick up the food. On my way, I realized that I needed a cake, too becauase Farhan has a sweet tooth and it just wouldn't be a proper holiday meal without dessert. So, I decided to go to WalMart to pick up a cake. I wasn't sure how people in rural Illinois would act toward a woman in a hijab, but I soon learned. A lot of people stared, but it did not come across as malevolent at all. Rather, it seemed like they were curious. As a white girl who lived in a very rural part of Japan a year, I have become quite a connoisseur of stares. I know mean stares (which of course were rare in Japan but occasionally happened), and I know curious stares. These were curious stares. No one was openly rude to me. On the contrary, I felt like people were almost going out of their way to be nice, as if to communicate, "I am not racist and I have no problem with you shopping here." It was a bit awkward, but much preferred over hostility. When I went to the check-out counter, the woman asked brightly, "So, how are YOU doing today?" "Oh, I'm just FABULOUS!" I answered just as enthusiastically. "Oh, that's just GREAT to HEAR! Most people just say they're GOOD, but you are FABULOUS! Well, I'm leaving work soon, so I'll be FABULOUS, too!" "Oh, that sounds GREAT!" I bubbled. At Los Potrillos, the Mexican place, I literally had to tell the staff four times that it was fine, I could carry my bags to my car by myself. I had to demonstrate, "See? I can do it. Three bags on this arm, four on this one!" Now, granted, I've never picked up seven bags of food from Los Potrillos before, so I don't know how they usually act (though it would be a neat experiment), but it seemed a little excessive. In general, though, rural Illinoisans lived up to my thesis that Midwesterners really are the nicest people on earth, and I was proud to be one. What surprised me, though, was how wearing the hijab changed MY behavior. On one trip home from Japan, I surprised my parents by meeting them in the airport wearing a kimono. However, I wasn't concerned about my behavior because I still felt like I was representing myself. No one would ever mistake me for a Japanese. Everyone would guess correctly that I was someone who just visited Japan. However, the abaya and hijab, for better or worse, have become not just cultural clothing but also religious clothing. When I walked into WalMart wearing them, most people probably assumed that I was a Muslim--not a study abroad coordinator playing dress-up. I understood the implications of this. Unintentionally, I had become a representative for a religion that's not my religion! Since there are few Muslims in rural Illinois, I had no doubt that many of the people who saw me would form their opinions of Muslims based on the behavior they witnessed from an Episcopalian girl from Ohio. This means that I had a great responsibility to be on my very, very best behavior. Therefore, not only was everyone very nice to me, but I was also extremely nice to them. No fist was shaken at the guy who cut me off in the parking lot. A big smile remained plastered to my face. This made me reflect--if everyone I met judged my religion, my workplace, and family by my actions, how would they feel about those things? I think this was the best effect that wearing the hijab had on me. It made me seriously consider my actions before taking them and act with more love and compassion toward others. Unfortunately, this wasn't enough to make the hijab stay on my head. At about noon, I decided that four hours of head sweat was enough, and I retired the hijab for the rest of the day. I'm so sorry to my Saudi students--I tried, but I just couldn't do it! Our firm belief in the love of God--compounded with something I once read that stated that a child's understanding of God is fully formed by the time they are five--has caused me to consider the importance of how we respond to our little guy's needs. And, we try to respond with love because his understanding of God is going to be grounded in the understanding of love which he has learned from us. Therefore, when he cries we tend to him. We do not leave him to cry alone and we respect that his only way of telling us that something is amiss in his world are his cries. This does not mean that we never allow him to cry or give him everything he might want in the moment...it means that he knows that his cries were heard, and that when he needs us we will come to him. We may not be able to "heal what ails him" (for who can stop teething pain?) but we will be with him. Because, if we want our son to understand that God is the unfailing presence, the abiding love, the lover of souls and the one who answers our cries, then we must respond to him with love at all times. When I worked in the children's hospital I witnessed this response of love in the midst of some of the most horrific situations parents could find themselves in. Parents who could not stop the pain of mucositis or the shivering and shaking of seizures--these are the parents who taught me the most about God's presence. For in the midst of the screaming (for often it was screaming--but even worse was silence) they would hold their child and wipe away their tears. "Mommy's right here..." again and again and again they would whisper. They could not take away the pain, but no one cried alone. Now, thank God (and this is prayer not profane) that I am not that parent in the hospital. And, I pray that I will never be. But, my lesson has been learned...our child will not cry alone. He will not face the darkness without the knowledge that his mommas will be there if he needs us.